The Liars Club: Soggy Opening Day! The tradition continues this Saturday. 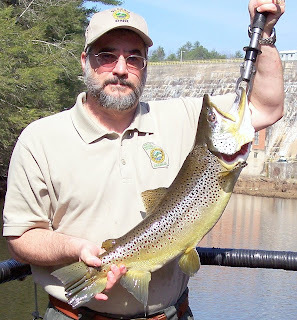 RENEW YOUR FISHING LICENSE AND TROUT STAMP. At nine bucks and five for the trout stamp, you get a year of entertainment. That's cheaper than a trip to the movies or a restaurant! 3) Much needed groundwater and reservoir recharge! Just use your knowledge of stream discharge (USGS real time water data), crowd size, and DNR stocking plans to help you pick the best streams. The best may not be the biggest. Remember that smaller streams with smaller watersheds will have more rapid runoff and will be wadeable quicker. They often don't have the big crowds of the big-name waters like Cooper, Wildcat, Dicks, and Holly. Also look for flood refuges in small and large streams, as those places in the channel may stack up with fish. Use enough lead to get down to those trout, which are trying not to get blown downstream into a reservoir full of hungry largemouths. And, for folks with a bit harder time getting to the creek, we now have a list of more accessible streams (thanks to WRD trout stocking coordinator Perry Thompson at Burton Hatchery) here: http://www.gofishgeorgia.com/documentdetail.aspx?docid=34&pageid=3&category=fishing Hey, none of us are as young and nimble as we used to be. 4) More events at NGTO and on many Georgia TU chapter websites.